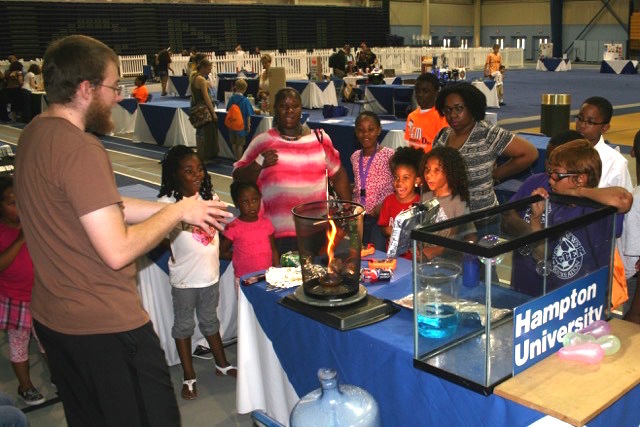 The Hampton University Atmospheric and Planetary Science Department took its show on the road on Saturday, May 30, to Christopher Newport University’s annual STEM Day celebration. Faculty members John McNabb and William Moore were joined by graduate students John Blalock, Liqiao Lei, and Earnest Nyaku inside and outside the CNU Field House to demonstrate atmospheric and planetary science topics to kids and parents from throughout the tidewater region. John McNabb illuminates the mysteries of the fire tornado to excited students and parents. The Fire Tornado demonstration was one of the most popular of the day, and the HU table was attended almost non-stop. 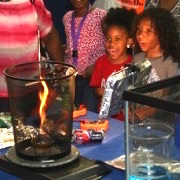 Hundreds of students and families also saw demonstrations of buoyancy using sulfur hexaflouride gas in balloons and in a fish tank, and the greenhouse properties of air, carbon dioxide and sulfur hexaflouride were demonstrated using a soda-can radiometer and a light bulb. We also made cloud bubbles using water and dry ice and floated them on the sulfur hexaflouride gas in the tank and John Blalock also demonstrated the effects of density on sound velocity using the SF6 and his indefatigable voice. 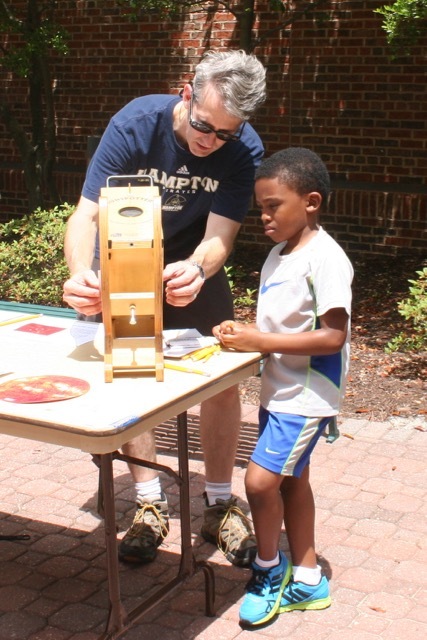 Dr. Moore helps a young student observe sunspots and trace the sun’s outline using the Sun Spotter. Outside, Dr. Moore shared views of the sun in the Solar Telescope and the Sun Spotter. The Sun showed off some excellent prominences — but only one sun spot — which many visitors were amazed to discover was the size of the Earth! The outdoor demonstration also featured Dr. Anna DeJong and Dr. David Gore from CNU’s PCSE Department and Bird Taylor of NASA Langley and the Virginia Peninsula Astronomy/Skygazers showing different views of the Sun. Dr. Moore also demonstrated the scale of the Earth-Moon system using a basketball Earth and a golf ball Moon. APS web developer Emily Hill was also a part of the festivities choreographing a ballet routine with her students that demonstrated acoustics concepts using movement. All in all it was a rewarding day of science outreach, and APS thanks CNU for hosting us and looks forward to next year!